Greetings unto the Populace of AEthelmearc from Master Anias Fenne! As the memories of War begin to fade, and the weather begins to turn cooler, let us not let our learned skills fade or our fire and passion for the fight begin to cool and sputter as well. As such, I am announcing the beginning of a Kingdom wide, long, tournament series designed to test your mettle, prowess, and persistence. I introduce to you…. The AEthelmearc 300!!! Per the rules listed below, the shortest time that this tournament series can take will be over the course of two years, with the possibility of it being longer. There will be copious prizes awarded over the course of the series, with the ultimate final prize to be more than worth the effort! So please join in and test your self against the best this kingdom has to offer. The first leg will be held at the approaching Harvest Raid in the Shire of Heronter on Sept. 30th. The more participants we have, the better the prizes, and First prize for this leg will be a handmade steel buckler crafted by myself! So come, join us, and let us work together as a kingdom to test each other and hone our prowess! 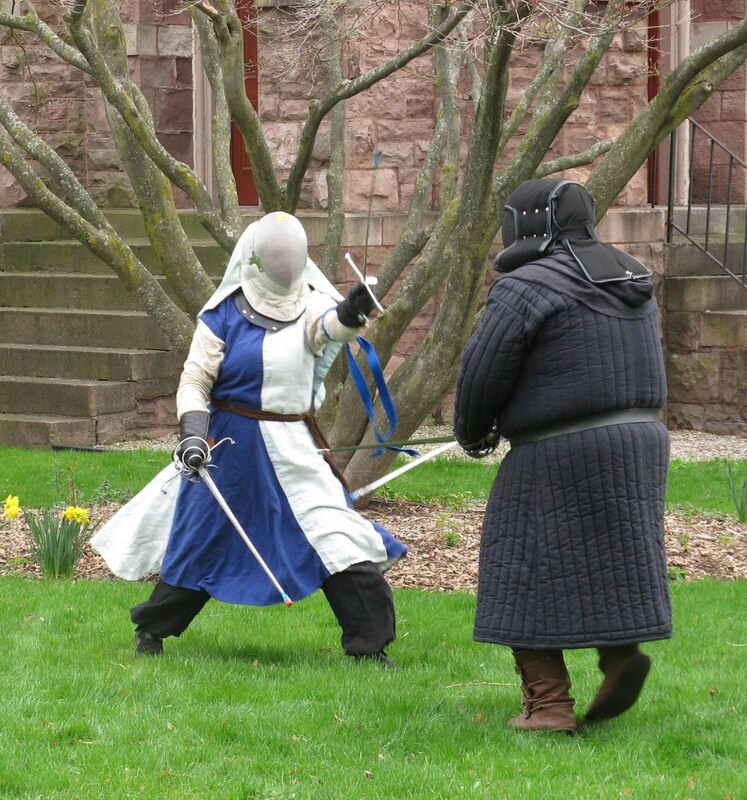 The Aethelmearc 300 (AE300) is an on-going rapier tournament series to be hosted three times a year at various events through out the Kingdom of AEthelmearc. Each leg of the tournament lasts until the first person reaches fifty points or the allotted time has elapsed. All fighting will immediately cease at that time. There will be significant prizes awarded for each individual leg of the series, with the number of prizes dependant on the number of fighters. The AEthelmearc 300 will end when one fighter emerges from the list with three hundred points. There will be prizes for the top several finishers in the overall standings, and the top prize has yet to be officially confirmed… but let me assure you, it will be a prize worth fighting for! The tournament must have a minimum of six fighters to be held. There will be one list per 8 fighters. There will be one prize awarded for each list in the leg of the tournament series. Chivalric behavior is expected at all times during the tournament. MIC has the right to remove a fighter from a leg of the tournament for infractions of the rules. A win is 1 point. No points for losing. Winner holds the list until defeated or a double kills occurs. Double kills = no points and both fighters retire from the list. All defeats will be reported to the MOL immediately before returning to the queue. Knocking down list ropes, poles, etc. more than twice is a loss. If no fighter reaches 50 points at an event there is no winner and no prize is given. Points will still be tallied and added to any previous points earned.